Just Piano Stools for the widest choice of quality piano stools. UK postage is included in the price. These Tozer adjustable piano stools are available to order. Please allow up to six weeks for delivery. The Tozer 5030 solo adjustable piano stool features adjustable height with tapered, fully braced legs. Available in satin or gloss finish. The seat is available in vinyl, dralon or leather in a range of colours. Also available without braced legs as the Tozer 5018. 57cm wide, 33cm deep and 48/58cm high. This Tozer adjustable piano stool has braced legs making it ideal for home or educational use. Tozer also manufacture the 5018 adjustable music stool without the leg bracing. Woodhouse provide an even larger range of adjustable piano stool. If you prefer a deep buttoned leather top then try the Tozer concert piano stool or from Woodhouse the MS201 concert piano stool. 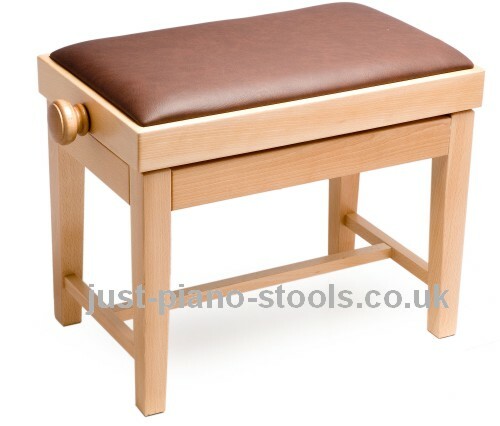 Tozer adjustable piano stools are available is a choice styles, wood colours, finishes and fabric colours. All available to order online. These adjustable piano stools are manufactured by Tozer and are made to order. Please allow six weeks for delivery of your new piano stool. Woodhouse also offer a range of solo adjustable piano stools with a wide selection of options.